Pangkor Laut is a privately owned island located three miles off the West Coast of Malaysia along the Straits of Malacca. This piece of paradise has been two million years in the making, and here you will find one of the world’s premier resorts nestling in the shade of forest giants as old as the land. You will find no other resorts – just secluded bays curled around pristine beaches, evening skies woven with colour, and a deep sense of serenity reserved exclusively for our guests. A combination of luxury, natural beauty and age-old wilderness woven together to produce an environment where peace and magically memorable moments are the currency. Of the island’s 300 acres, only a fraction has been developed to house the Resort and its eight Estates. Wooden buildings blend seamlessly into the forest as if nature had been the architect dictating how walls curve around foliage, and roofs open up to allow trees to continue on their journey to the sky. 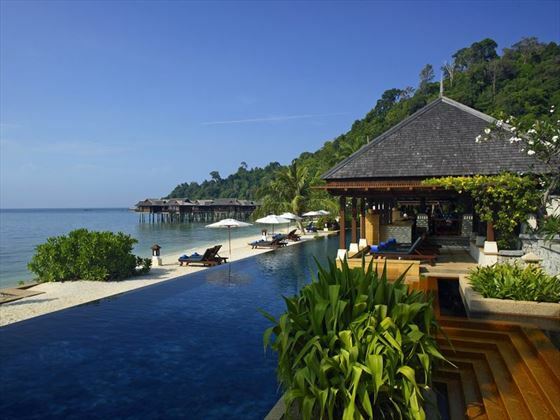 Pangkor Laut is located on a privately owned paradise island off the West Coast of Malaysia. 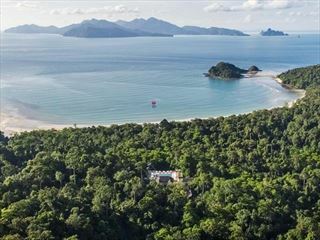 Fly into Kuala Lumpur and transfer over to the Marina Island Pangkor to take the resorts speedboat, around 15 minutes over to the private island. 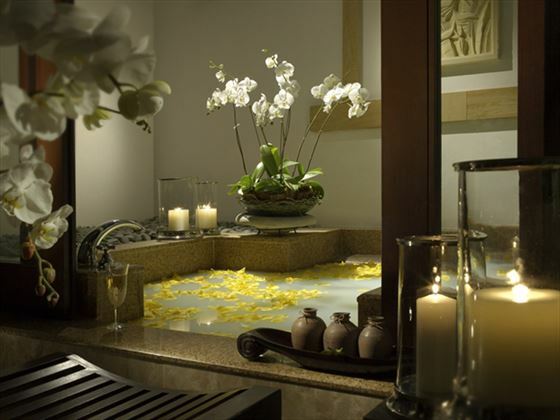 The main Resort offers guests a choice of three suites and four different villa styles. 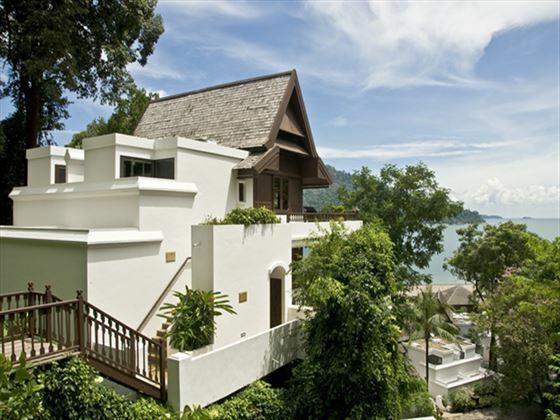 You can choose from garden villas, hill villas, beach villas, sea villas – over water, or spa villas. There are also suites. 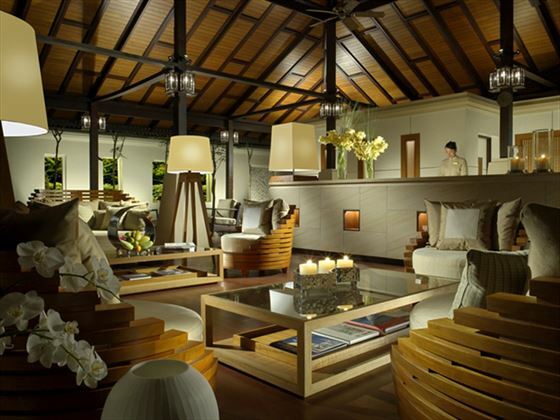 The villas are all designed to accommodate two guests. 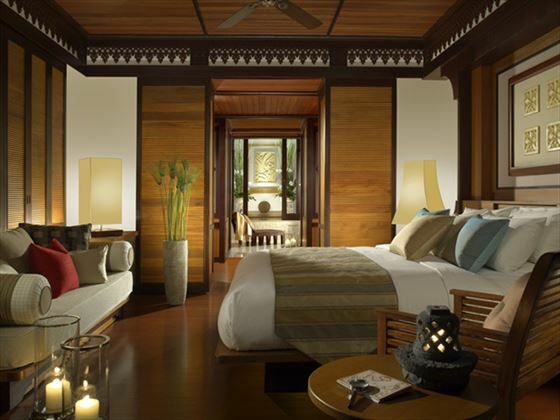 Every villa and suite features spacious interiors, luxurious fabrics, and private balconies with cushioned deck chairs. Ensuite bathrooms have large vanities, and, depending on the villa, a separate shower and oversized tub in a private outdoor courtyard or with large windows opening out onto the tropical gardens or sea. All villas have thermostat controlled air-conditioning, king-size bed, writing desk, an electronic safe, direct-dial telephone, hairdryer, refrigerator and coffee and tea making facilities. Additionally, there is a CD-player with a large selection of music available from the Library. 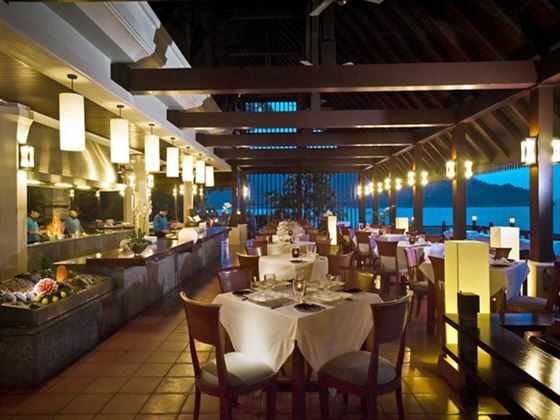 Fisherman’s Cove - Situated near Spa Village, Fisherman's Cove features a unique symphony of seafood themed dishes which focuses on sustainable fishing practises and the freshest ingredients. The seaside restaurant welcomes children aged 16 years and above for the comfort of all our guests. Proper dress code is required with shirt, full-length trousers and shoes for gentlemen and smart casual wear for ladies. Uncle Lim’s Kitchen - This interestingly designed restaurant is built atop a rocky outcrop overlooking the sea. Named after the chef who has been with the Resort since its inception, Uncle Lim’s specialises in Nyonya and Hockchew Chinese-style home cooking. All dishes are inspired by the unique products available locally, and made to each guest’s individual tastes and requirements. A unique experience for those who enjoy the exotic flavours of the East. Royal Bay Beach Club - Royal Bay Beach Club, overlooking the infinity pool serves a selection of Asian and Western favourites for lunch. In the evening, the restaurant transforms into a chic chill-out lounge serving cocktails and other beverages. Chapman’s Bar - This bar is named after a famous British Colonel who sought refuge at Emerald Bay before his dramatic escape by submarine in 1945. 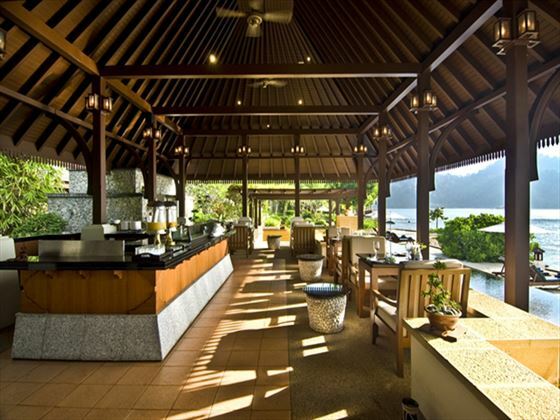 Chapman’s Bar sits on Emerald Bay, and serves excellent light lunches daily, including sandwiches, traditional satay, salads and tasty seafood dishes. A variety of beverages are served throughout the day, a short walk from your beach chair. Jamu Bar - Located in a peaceful enclave of the Spa Village, overlooking the lap pool and Straits of Malacca, the Jamu Bar serves healthy salads and speciality drinks. Feast Village - Breakfast is a vibrant, interactive dining experience with diverse culinary offerings from the Asia-Pacific region and beyond. The Feast Village also features a patisserie, café, chef's table and wine cellar where guests can purchase wines of their choice. 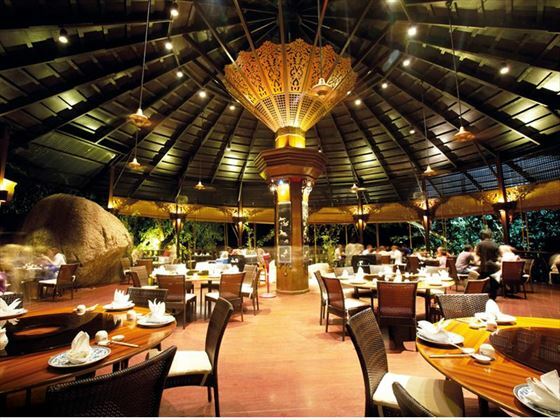 For dinner, the Feast Village introduces diners to local delicacies and flavourful Malay cuisine. 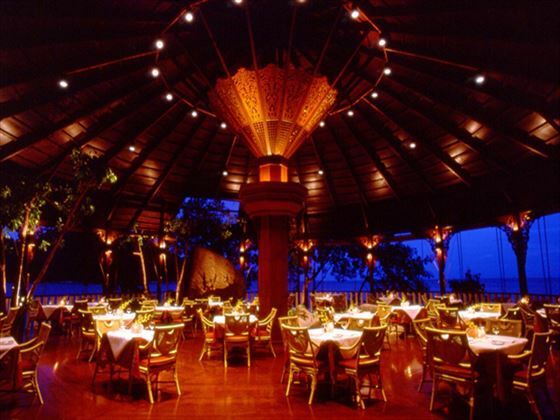 The Straits - The Straits, set against the rocks overlooking Royal Bay, provides a beautifully crafted private dining experience in private booths of natural timber, adorned with granite and silk. The talented chef, specialising in Southeast Asian cuisine, will curate dinner menus based on guest’s personal preferences. The restaurant welcomes children aged 16 years and above for the comfort of all our guests. Proper dress code is required with shirt, full-length trousers and shoes for gentlemen and smart casual wear for ladies. To allow for market-fresh ingredients to be sourced, a 24-hour reservation in advance is required. Private Dining Experiences - Explore the resort’s range of private dining experiences at a selection of stunning private locations, each with its own choice of menus. Choices include dining on the rocks at Emerald Bay, on the beach at Fisherman’s Cove or at The Straits with an Executive Chef to assist in crafting your own menu. Honeymooner's are required to provide a valid Wedding Certificate or copy at time of booking and check-in. Honeymoons must be within 12 months from the date of the marriage. Anniversary couples are required to provide a valid Wedding Certificate or copy at time of booking and check-in. Anniversary date must be within the month of stay.